Duval-Leroy, headquartered in Vertus and founded in 1859, is one of the few Maison led by a woman, CaroleDuval-Leroy. The company owns 200 hectares of vineyards that supply a quarter of the annual requirement for the production of five million bottles. The Maison is definitely one ofthose grown faster in recent years, both qualitatively and quantitatively while maintaining excellent value for money. Not always the style of this house meets my taste, but on this occasion we speak to one of my favorite brut champagne. This is a non vintage brut assembled exclusively from grapes from Premier Cru and Grand Cru villages (50% Chardonnay, 50% Pinot Meunier), created in 1911 by RaymondDuval-Leroy’s will to create an exceptional wine. Visual examination shows a pale yellow discharge, with abundant and very small bubbles. The nose is conturbane, with white flowers (he was dubbed “Fleur de Champagne” by its inventor), and tropical fruits, especially pineapple. Peach and citrus on the palate supported by well integrated acidity and a finish on mineral tones. It can be an excellent aperitif or accompaniment to raw fish or cooked very simply. 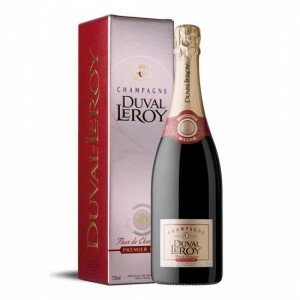 In conclusion, a highly fragrant champagnes easily enjoyable and pleasant for everyone. For me one of the best ever in the price range under 30 Euro.